A few years ago, I awoke to a dead possum on our patio. Our house, in a solidly middle-class Chicago suburb, backs up to woods, so wildlife sightings aren’t unusual. But this posed a problem. Was it really dead? Or playing possum? I watched for a while; my young daughter did too. No sign of life. After an hour, I asked my husband to move it into the woods. He came back, shovel still in hand, reporting he’d seen movement. 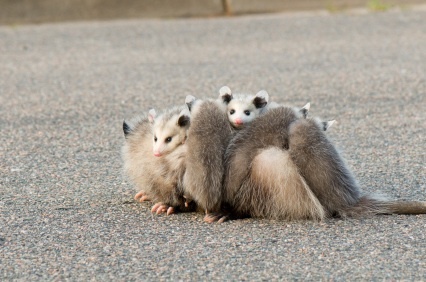 Turns out the possum was indeed dead, but there were nine furless, very-much-alive babies in the pouch. We transported dead mama and needy babies to a local wildlife rehabilitation center and cheered when we heard eight of them survived. Some of our neighbors see the wildlife as a nuisance. “How do we get rid of the skunk?” “I’m afraid of the coyote.” “The possum freaks me out.” One neighbor chopped a harmless garter snake to pieces—a personal phobia for him, the end of the line for the snake. “On Earth Day?” I cried sadly, perhaps insensitively. Other neighbors feed them, putting out scraps or even bowls of food. This seems kind, but I’m unsure. I don’t believe in meddling with the natural world. My family (except for the dog, who tries mightily to interact) has chosen to simply observe. We live side-by-side, in startlingly close proximity, though our lives are vastly different. In the case of the possum, I felt drawn upon to intervene. Sometimes it feels wrong not to: a year ago, I plucked an empty yogurt cup off a bewildered squirrel’s head. He shook his head, glanced up at me in surprise, and hurried off. I knew better than to expect gratitude, but was slightly disappointed nonetheless. Last summer, my daughter inadvertently frightened a mama bunny in the process of giving birth. We found two newborns under a nearby bush the next day. We returned them to their hole and watched the site obsessively from our window until, days later, they all successfully made their way into the world. Sometimes they choose to interact with us: several times, a curious raccoon peered in our bathroom window, his nose literally inches from my daughter’s. I silently thanked the windowpane. Bats often swoop overhead as we play catch on our driveway. A turtle ambled up our driveway last summer—looking for a lift back to the pond? We are twenty minutes from downtown; we can hear the roar of two expressways from our house. But sometimes it feels like Wild Kingdom. Deer, herons, groundhogs, great-horned owls … they’ve all graced our windows. The wild isn’t always welcome. I suspect a least one skunk lives under our deck and I’ve suffered many sleepless nights due to the overpowering smell. Someone took up residence in our attic: it sounded like a band of gypsies but was probably the peeping Tom raccoon. Last week my late-night television viewing took a backseat to the mouse that darted repeatedly between the television and the bench. The mouse unnerved me more than I care to admit. I feel compelled to insert here that I am not a terrible housekeeper. Honestly. Sometimes it’s just hard to keep the outside out. We fixed up the raccoon entrance hole in the eaves. I’m still struggling with the skunk and the mouse. Or, more likely, mice. But mostly, I live for it. In this world of spray-on-tans, Twitter, Botox, the Kardashians, of marriages forged on television shows, where people are too often celebrated for their looks rather than their accomplishments, my backyard is ... well, real. These creatures are searching for food, trying to survive. They don’t care how they look. They don’t care for fame or fortune. Food, safety, reproduction, maybe some comfort. They remind me what is real. A magnificent red fox—a recent addition to the neighborhood—was skittish when he first arrived. He was terrified of us, and of our barking black lab. We would be fortunate to catch just a quick glimpse of the white tuft on his tail as he darted across the lawn. Now, just a few months later, he stares balefully back as my dog tries futilely to frighten him off. The change in his behavior worries me. What are we teaching these wild creatures? Not to fear us? To rely, perhaps, on the neighbor’s handouts? By being encased in our box of windows and walls, are we sending a message that we fear them? Do we? I’m a little clearer on what they are teaching us. When my kids come home from the high school and middle school, their heads full of the little social episodes that occurred that day, nothing pleases me more than a wildlife sighting. “Fox!” my daughter will cry, or “Two coyotes in the side yard,” my son will report. And we all rush to the windows, hoping to get a good look before the dog’s barking sets in. This is real. This is life. Timeless. Forget the Kardashians, those slights at school; this is reality. Despite the unnerving mouse, the smelly skunk, I consider them all blessings. Each sighting is a little bit of magic in my life. Every glimpse makes me wonder about our relationship, our connection. What is the right way to live alongside these creatures? That mama possum should, by all rights, have chosen a spot in the woods to die. But she elected to die on my patio, right where we would see her. Who knows why? I like to think she knew I would save her offspring. On that day, observing didn’t seem the right answer. From one mama to the other, I was honored to help.